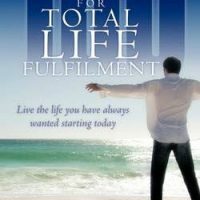 100 Tips for Total Life Fulfilment (TLF) is a book that changes lives. It is the ultimate guide to living every day of your life feeling happy, positive and contented. It is about making your dreams a reality and knowing exactly where your life is going and putting you firmly in charge of your own destiny. This is not just another airy-fairy ‘feel good’ book though. Instead, the book distills a massive amount of life-changing techniques into just 100 simple to follow tips that provide a realistic, practical guide to achieving all your life goals. Every tip in this book has been thoroughly proven to work and includes easy exercises to turn simple ideas into effective actions that really do make a huge difference . If you have ever felt that you deserve ‘better’ or that your life was ‘losing direction’ then this is the book for you. 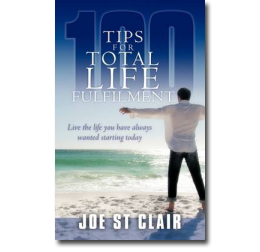 Joe St Clair is a freelance writer and life coach that is passionate about helping ordinary people make extraordinary changes to their life in order to achieve their dreams. With a backgound of over 20 years as a Management Consultant Joe has worked in the boardrooms of some of the largest organisations in the world helping them succeed by developing the capability and potential of their greatest assets – their employees. In addition to his work in management consultancy Joe runs his own successful life-coaching business which focuses on helping individuals achieve their life goals. Joe is also an established freelance writer who has written hundreds of articles for leading business and lifestyle magazines. If you have read the book, please send us your review by clicking HERE>>> and we will add your feedback to the review section below. At last somthing new and different. The world is full of books but only some deliver on their inspirational promises – this is one of those few.I realy liked the can do style and the focus on practical applications – it deserves to be on everyones reading list and in every consultants tool box. It’s very rare that I ever read a book that inspires me to change the way I approach life itself. This is one of those “life changing” books, packed to the brim with thought provoking tips and ideas on how to get the very best out of life. Very well written, packed with ideas that you can implement immediately to improve your life, the live of those around you, and it’s well balanced with humour and great anecdotal examples. I particularly like the exercises aimed at helping you adopt the approaches and have found these to be incredibly helpful. This is one book that will definitely not be sitting on my bookshelf as it’s now become a constant source of reference for me.